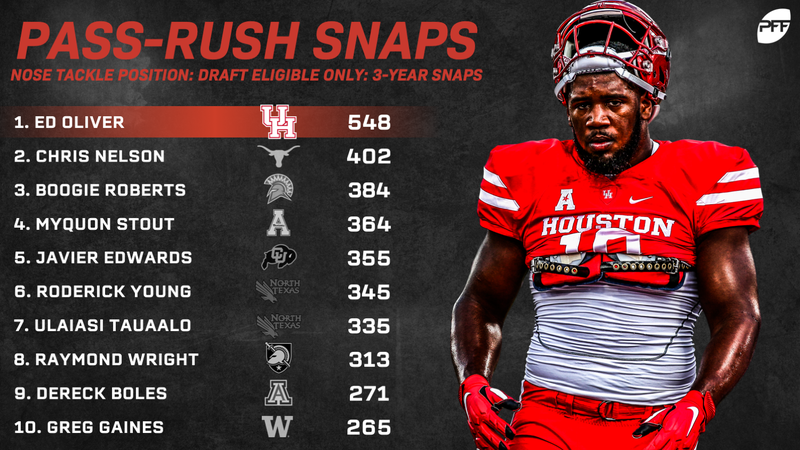 Last week, we dove into the PFF data to dissect Michigan edge defender Rashan Gary’s middling grades, and this week we look at Houston’s Ed Oliver. 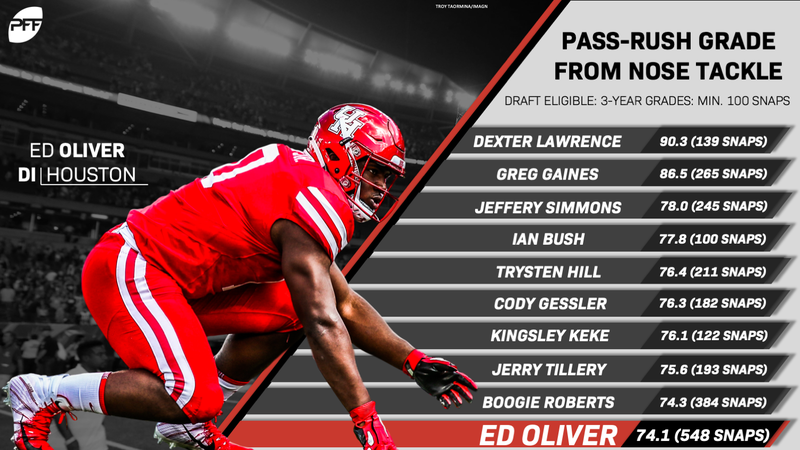 Oliver came into the 2018 season with excellent overall PFF grades, finishing at 88.0 in 2016 as a true freshman and 91.4 overall in 2017, however, his pass-rush grades were average, at best. Most of his grade was coming from outstanding play in the run game where Oliver has been unblockable during his time in college, grading at 90-plus during his first two years and duplicating that with a career-high 94.6 grade against the run in 2018. Physically, Oliver has an incredible skill set that features one of the best get-offs in college football while changing direction like a safety. Oliver looked like an athletic freak in relation to his college peers, but that brought up more questions than answers. Why did he have pass-rush grades in the high-60s during his first two years of college, and while he improved to 88.8 in 2018, how did he notch only 26 total pressures against inferior competition in the American conference? The answer may lie within the PFF data. It starts with Oliver’s usage as a 0-technique nose tackle (head up on the center). This alignment can result in one-on-one opportunities against overmatched centers, but given the nature of Houston’s three-man line and high percentage of three-man rushes, Oliver was constantly battling against a center and at least one guard. Rushing from the nose is detrimental to pass-rushing production across college football and Oliver was put into this position more than any interior defensive lineman in the draft class as he rushed from 0-technique 548 times over the last three seasons. The results were good when comparing to the rest of the class, but the pass-rush grade was still lower than what you normally find from other interior positions. So what happens when Oliver gets a chance to rush from other positions? The results are much more in line with the other top players from the draft class. 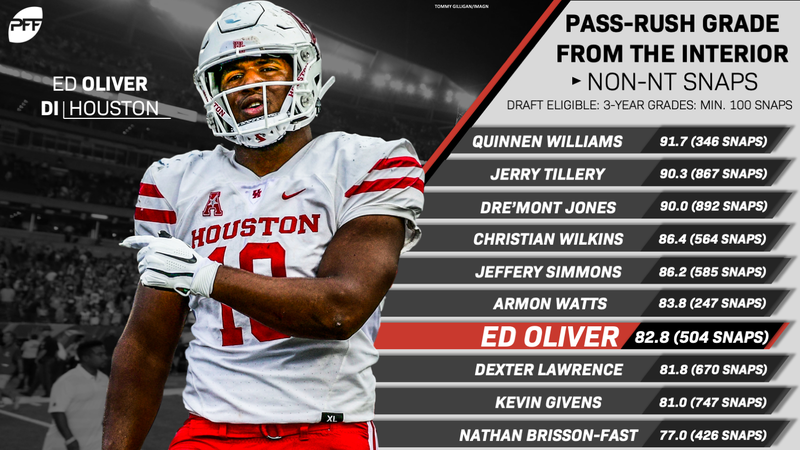 When rushing from non-0-tech positions, Oliver’s pass-rush grade is seventh in the class, and he’s surrounded by fellow first-round hopefuls Quinnen Williams, Jerry Tillery, Dre’Mont Jones, Christian Wilkins, Jeffery Simmons, and Dexter Lawrence. The most fascinating part of this breakdown is that Oliver has more rushes from 0-technique (548) than rushes from all other positions combined (504). That puts him at a serious disadvantage when comparing his production to his peers, and for that reason, we have more hope that Oliver can be deployed as an effective pass-rusher at the next level while continuing his disruptive ways against the run.